American novelist and short story writer (1804-1864). Autograph letter signed. US Consulate, Liverpool. 8vo. 3 pp. 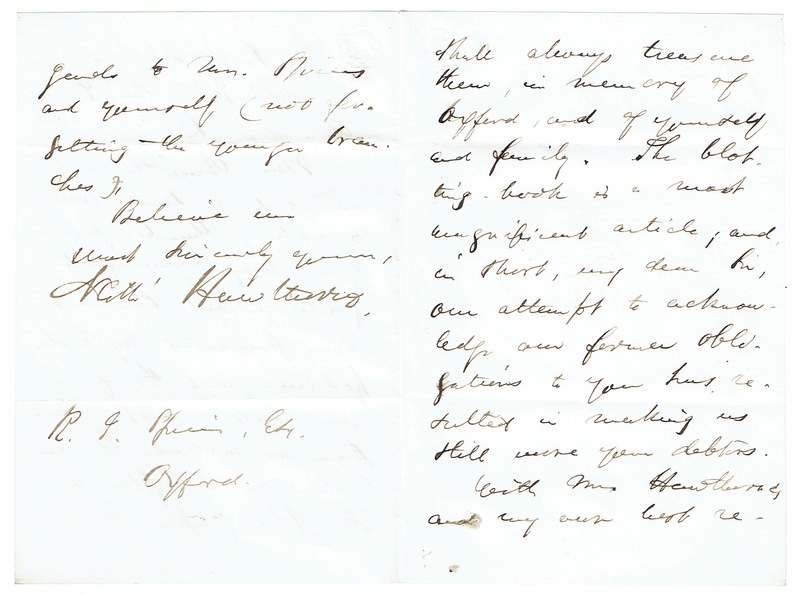 To R. J. Spiers with thanks from himself and his wife for gifts ("[...] We are both of us delighted with the photographs, and shall always treasure them, in memory of Oxford, and of yourself and family [...]"). - The Hawthornes spent a weekend as house guests of Spiers in September 1856 following which, on 26 December 1856, Hawthorne had presented Spiers with a specially bound eleven-volume set of his own works (see R. Hull, Nathaniel Hawthorne: the English Experience, 1853-64 (1980), p.94). 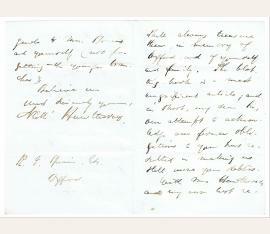 This gift evidently elicited a further reciprocal gift from Spiers, which Hawthorne acknowledges in this letter. Hawthorne paid further compliment to Spiers in the conclusion of his essay 'Near Oxford': "[...] We feel a genuine reluctance to conclude this article without making our grateful acknowledgments, by name, to a gentleman whose overflowing kindness was the main condition of all our sight-seeings and enjoyments. Delightful as will always be our recollection of Oxford and its neighborhood, we partly suspect that it owes much of its happy coloring to the genial medium through which the objects were presented to us, - to the kindly magic of a hospitality unsurpassed, within our experience, in the quality of making the guest contented with his host, with himself, and everything about him. He has inseparably mingled his image with our remembrance of the Spires of Oxford [...]"..